People were worried about Jimmy Butler. Why is he deferring so much? Why does he only show up in the fourth quarter? Has he lost a step defensively? That was regular season Jimmy Butler. Playoff Jimmy Butler is apparently a whole different animal. Butler was the only real bright spot in the Sixers' 111-102 loss to the Brooklyn Nets in Game 1 Saturday at the Wells Fargo Center (see observations). He poured in 36 points and at times looked like the best player on the floor. He was aggressive on both ends and looked like a completely different player from the regular season. "That was the adult in the room," Brett Brown said. "That was a man and I think that especially like we've seen it here in Philly in the regular season, fourth periods stand out a lot, you saw it kind of consistently spread throughout the game. The physicality of the game, the elite athleticism, the toughness. It is true, he was the adult in the room, and he was trying to pull others along." Butler shot 50 percent from the field and also added nine rebounds, two steals and two assists. The only other Sixer to go for at least 36 while hitting over 50 percent of his shots with nine boards, two steals and two assists in a playoff game is Julius Erving. Butler's outstanding performance was wasted though. The only stat that stands out in a negative way is that Butler didn't have a single assist, but it's hard to pin that on the four-time All-Star. Butler went 11 of 22 while the rest of the starting five went 13 of 38 (34 percent). Butler has always said that the offensive part of the game came easy to him, but did express regret over not being able to get his teammates going. "I think I can score the ball pretty easily," Butler said. "The thing that bothers me the most, to tell you the truth, is the fact that I didn't have a single assist. I think if I'm getting everybody involved and everybody else is hitting shots, I think the game goes a different way. Going to study the film and see how I can find my teammates better, to tell you the truth." 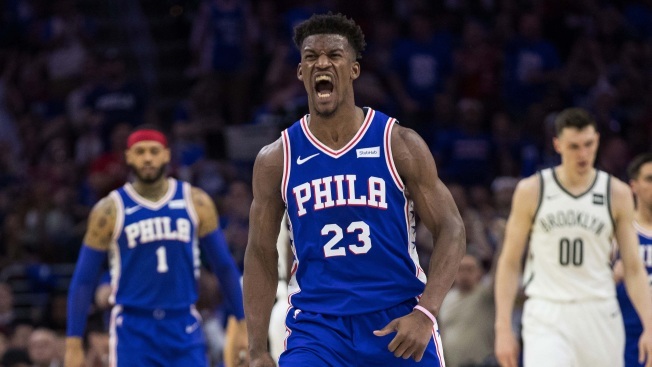 After how things transpired in Minnesota, Butler came to the Sixers with a reputation - fair or unfair. To his credit, the sentiments he echoed after Saturday's loss matched what he's said since he got here. But still, his unselfishness on offense was the biggest criticism during the regular season. Another was his on-ball defense. On a play against D'Angelo Russell in the first quarter, it was evident Butler wasn't messing around in this one. After the block, Butler chased Russell into the corner and bodied the young guard up, eventually causing Russell to commit a turnover. The Sixers weren't terrible defensively. The Nets shot 42 percent overall. The trio of Russell, Spencer Dinwiddie and Caris LeVert, who have all taken turns tormenting the Sixers this season, combined to shoot 24 of 57 (42 percent). That wasn't good enough for Butler. And while much was made coming into the series of the team's pick-and-roll defense, Butler thought it was more simple that that. "I just think we gotta guard better," Butler said. "That's what it comes down to. Whoever it may be, myself included. … We gotta get stops." While it's just one game, there is a little concern that the issues the Sixers had against Brooklyn in the regular season crept up at times in Game 1. Before a reporter could even ask if the Sixers were panicking after a Game 1 loss, Butler was already shaking his head. "No. … I'm telling you, we're going to be fine."